Sefer Ohev Yisrael, Chassidic homilies on the Torah, by Rebbe Avraham Yehoshua Heshel of Apta (Opatów). Zhitomir: R. Chanina Lipa and R. Yehoshua Heshel Shapira, 1863. First edition. This copy features a half-title page in addition to the standard title page. This additional title page is not found in most copies and is not recorded in the Bibliography of the Hebrew Book. 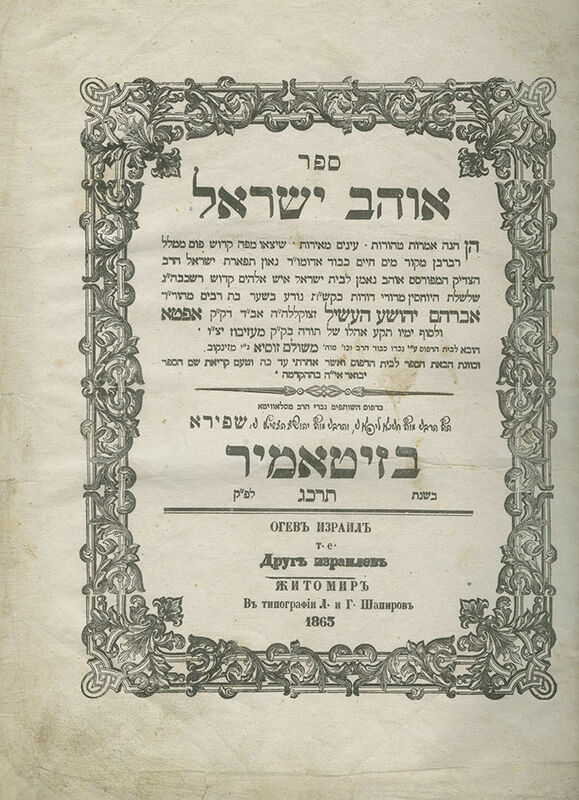 The book was brought to print by the grandson of the author, Rebbe Meshulam Zusia of Zinkov. He relates in his foreword how his father, Rebbe Yitzchak Meir, son of the author, realized that each person was recording the Rebbe's teachings according to their own perception, and was concerned this would lead to misunderstanding. He therefore chose one astute, outstanding Torah scholar and designated him to record the holy teachings, after which the writings were reviewed, and when necessary corrected, by the Rebbe. Later in the foreword, he explains that the book was named Ohev Yisrael, based on the author's repeated assertion that the one character trait he could confidently pride himself in, even before the Heavenly court, was his outstanding love for his fellow Jew. Before his demise, he instructed his sons to write no other praise on his tombstone but Ohev Yisrael (Lover of Jews). R. Yosef Shaul Nathansohn wrote in his approbation (to the Lemberg edition): "…he loved every Jewish person with his heart and soul, and would show great affection particularly to Torah scholars. And our fathers related to us that while he was here [in Lviv], all the leading Torah scholars of the city would arise early to come and absorb his wondrous teachings…". , 3-117 leaves. Including half-title page bound after the standard title page. Leaves 111-114 bound out of sequence. 26 cm. Overall good condition. High-quality paper. Wide margins. Stains. Marginal tears to title page and leaf of approbations, not affecting text, repaired. Worming and tears to final two pages, repaired. Several leaves presumably supplied from a different copy. Margins of several smaller leaves completed with paper to match other leaves. New elaborate leather binding.